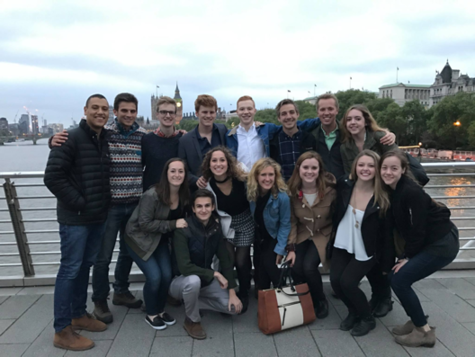 When Jim English, a Notre Dame senior, spent a semester at the London Global Gateway last spring, he gained knowledge of British politics that would rival most locals. He spent his Wednesday evenings sitting in the public galleries watching Prime Minister Theresa May debate issues such as Brexit and the refugee crisis. When his friends and family came to visit, he had full access to parliamentary grounds and was able to give them tours. From his desk, he could clearly hear Big Ben as it struck the hour. All of this was possible due to the internship program at the London Global Gateway. 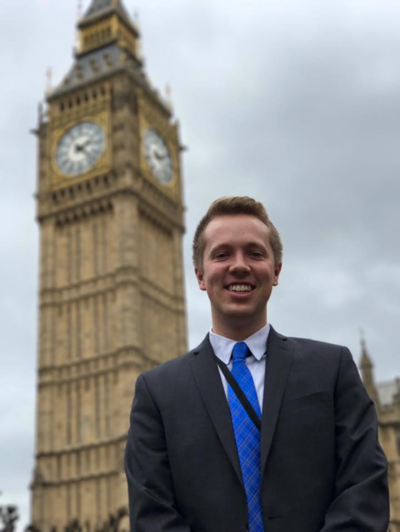 As a political science major, English applied for the parliamentary internship as soon as he heard he had been accepted into the London undergraduate program last semester. He was excited about the idea of getting to work in Westminster, and seeing first-hand how another country’s political system operated. English quickly realized that this opportunity was even more unique than he had anticipated. This snapshot into the British government was so unique, in fact, that his professors often called on the parliamentary interns to talk in class about their first hand experience of political policy decisions. It wasn’t all academic. The internship shaped his time in other, more unexpected ways. English recalls his two supervisors, who became close friends in and outside of work. He remembers how they used to play music in the office, and created a fun, relaxed environment, despite the serious nature of the work they did. English is still in touch with them, and said the internship program was critical because it allowed students to forge friendships with locals and really become immersed in the British culture. The prestigious nature of the environment of where English worked was one of the things he loved most about his time in London. However, working in a high-profile setting came with an unexpected experience. On March 22, 2017, English and several other interns were inside parliament when there was a fatal terror attack just outside Westminster. His office was sent into immediate lockdown and they were kept inside for over three hours to ensure their safety. While it was a scary experience at the time, English spoke less of the incident itself and more about the sense of community that emerged over the following days. He praised the London Global Gateway staff for speedy and reassuring communication, and said the spirit and sense of togetherness from the general London community made him feel comfortable and secure. English is one of many advocates for the internship program, not just because of his remarkable experience, but because of the impact it had on shaping future decisions about his career. Previously undecided about whether he wanted to work in government or in business consulting, English says he was excited by the work he did in parliament everyday, and this informed his decision about his future. “I want to be doing something that is meaningful for the rest of my life, and being involved with the government somehow is how I feel like I could do that,” said English. He plans to continue working with constituents and to be involved in government operations. Next year, he will move to Washington, D.C., for a consulting job within the Department of Justice. At the London Global Gateway, Program Specialist Nick Brill and Director of Student Affairs Judy Hutchinson have seen the number of internships grow from twenty-three to fifty-three under their direction. Nearly a third of all students in London are now assigned placements in environments from corporate to education and charities. “Internship placements offer the students an authentic study abroad experience, allowing them to delve beneath the surface of the culture in which they find themselves for four months,” said Hutchinson. Aside from the academic benefit of the internships, it’s the element of cultural immersion that is most valued by both students and staff involved with the program. Jack Byrnes, the chief financial officer for BBDO and a Notre Dame alumni, takes in seven or eight interns each semester, spanning four departments. In these positions, students work among colleagues from the U.K. and other countries, and contribute to a successful, global organization. It’s not just the multinational companies that benefit from the internship program. Fr. Anthony Homer is an assistant head teacher and chaplain at a school that takes several interns every semester. He’s impressed with the students’ level of engagement. The staff at the London Global Gateway work tirelessly to develop and expand internship opportunities in London. Hutchinson said they recognize that it allows their students to flourish culturally, spiritually, and academically. The students get the chance not only to integrate and learn from a British workplace, but also to offer their time and skills to their host organization. English described his time in Parliament as a “memorable experience that I will never forget,” and Hutchinson hopes that many more students come back to Notre Dame saying the exact same thing. To learn more about the internship program in London, please contact Judy Hutchinson. Originally published by Colleen Wilcox at international.nd.edu on May 23, 2018.